China Building Materials Industry Press, 2014-11-01. paperback. New. Ship out in 2 business day, And Fast shipping, Free Tracking number will be provided after the shipment.Paperback. 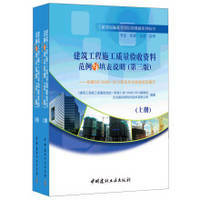 Pub Date: 2014-11-01 Pages: 1425 Language: Chinese Publisher: China Building Materials Industry Press building construction quality acceptance data examples and explanatory notes (third edition) (full two) The book has 11 chapters Appendix 2. the upper and lower volumes. covering the entire contents of system construction quality acceptance criteria of 18 gauge acceptance East. a total of 713 quality acceptance form. Chapter 1 introduces the acceptance of old and new data table cha... Satisfaction guaranteed,or money back.